The front door of a rented property is often an overlooked feature. But statistics turns out that nearly 66% of all burglaries are front door break-ins. Therefore, to secure the front door is one of the most important parts of home safety. It can prevent intruders from entering your house or apartment and keep you and the people who live in your home safe and secure. Unfortunately, many rental properties are not equipped with a proper door. This does not stop people who are not invited into your home, and increases the likelihood of a break-in. The good news is there are many ways to secure your front door from being kicked in by burglars. Keeping your front door locked and secure plays a key role in keeping your house safe. We will show you how to safeguard and protect your front door in 10 ways, one of which is to install a front door security camera. Some of these tips will also apply to back door security, including securing door hardware, locks, hinges, and frame. If possible, the front door of your home should not be the last line of defense. 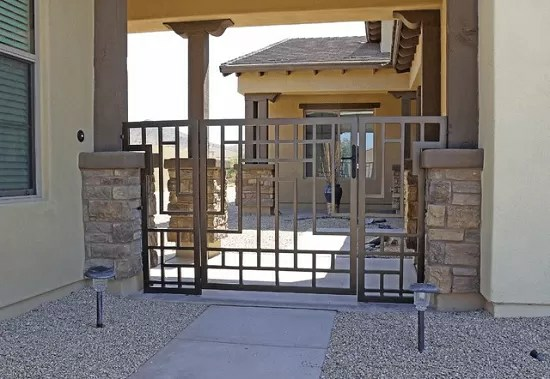 Instead, it is more effective to have some kind of security gates or doors that people have to be allowed to enter, before they come to the front door of your home. This is a system for larger homes with security gates that include a CCTV system and intercom system. Many people worry more about the style and color of a door, rather than the safety and security it provides. This is a huge mistake and could be costly in the future. Some older doors are hollow, so it’s important to check this and find out just how strong your existing doors are. 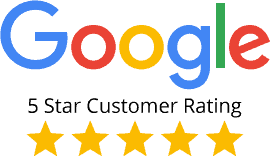 If they need to be replaced, you should make sure the new doors are made of high quality materials such as metal, solid wood, or fiberglass. 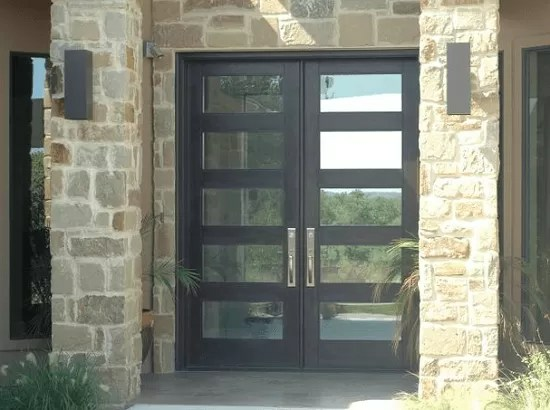 Metal or steel doors are often regarded as the best choice for exterior door security as to their insulation factor. And they are always hard for burglars to intrude. Wood-made front doors are also good for protecting your house, but make sure it is solid and strong enough. Glass doors are not recommended to be installed as front doors, since they are easy to be destroyed. But if you prefer to use this kind, ensure it has less glass embedded as possible. The next tip explains more details about securing glass front doors. A large number of doors include panes of glass. Some of these panes of glass are embedded in the door itself, while other doors are surrounded by a large amount of glass panels. This makes it more tempting and easier for burglars to break into your home. They simply have to break the glass and open the door. However, if you replace this type of door with a windowless door, burglars avoid this door and look for an easier target elsewhere. If you can’t replace your door with a windowless model, you can reinforce the glass in your door by applying unbreakable panels to the glass areas of your door. 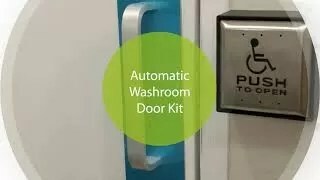 Door hardware includes hinges, handles, locks, fasteners, accessories and others. You will realise how easy it is to break in a front door if it has old hardware. 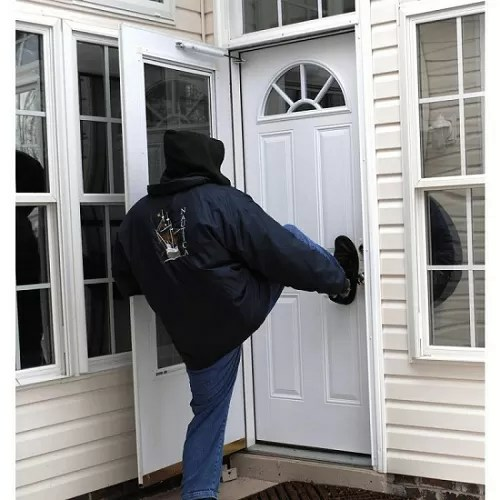 With two kicks in only five seconds, bobbers can break the doorjamb and get access into your house. 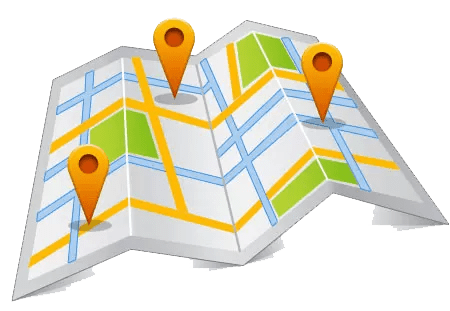 Thus, check if your front door hardware needs a change, and if you buy new, make sure you purchase them in a trusted professional door hardware store. Check every part of hardware, including security door knobs, door locks, hinges, and etc. We offer more detailed safety tips about every part of hardware. Keep reading. Try to choose the most secured front door lock to prevent kick-ins. 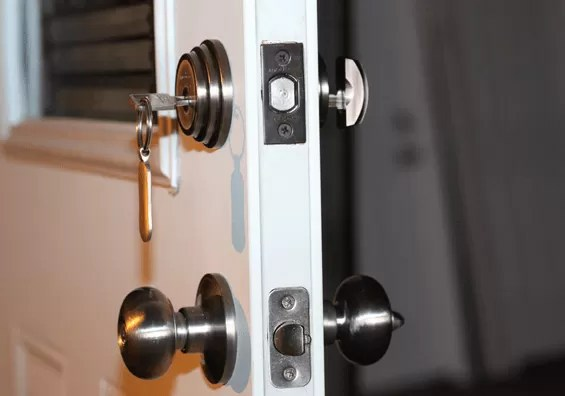 A wide range of deadbolt locks and dead-locks are available that make it much more difficult for burglars to force their way into your rented property. Deadbolt locks can be added to most types of exterior doors, except for sliding doors. The most secure deadbolt locks are made from solid metal and have no exposed screws. 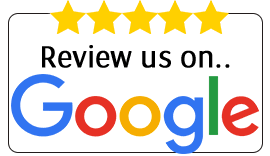 If your door already has an inferior deadbolt, it may be time to replace it with a higher quality product that makes it as difficult as possible to enter the property. Dead-locks make doors even more secure. 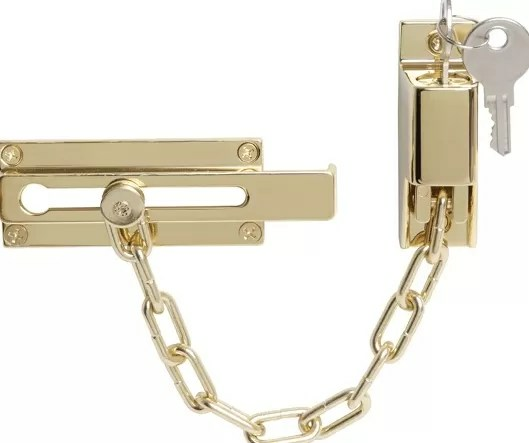 This type of lock does not have a key on the outside and it makes it extremely difficult to enter a premise without using a huge amount of force or finding a way to destroy the lock instead. Hinge is a necessary part of a security front door, which makes a big difference in home safeguard. This may relate to the door placement. Burglars often prefer to destroy a door swinging out, with the hinge pins exposed on the outside of the house. So make sure the hinge on the inside of the front door. If it is not, secure the front door hinge with strong, un-removable pins. You can also use setscrew and studs to add security. This will prevent burglars from removing the hinge pins and lifting up and off your front door. Never take home security lightly even if your front door is made of solid metal, with a sturdy lock installed. A secure and strengthened door frame is often neglected. A security forum once revealed a theft happened because the burglar pried the door frame. So how to make a front door frame nearly impervious to being kicked in? The most basic thing is to install several screws along the frame and doorstop, so that you can harden and secure the door frames to the wall. Make sure the door is clear of any obstructions or items that could act as cover for a potential burglar. This includes plants, outdoor furniture, trees or bushes that obstruct your view and makes life easier for a potential criminal. It’s important to know who is at your door before you answer it. This prevents you from talking to someone questionable or letting someone questionable into the property. The traditional peep hole is available for this purpose. 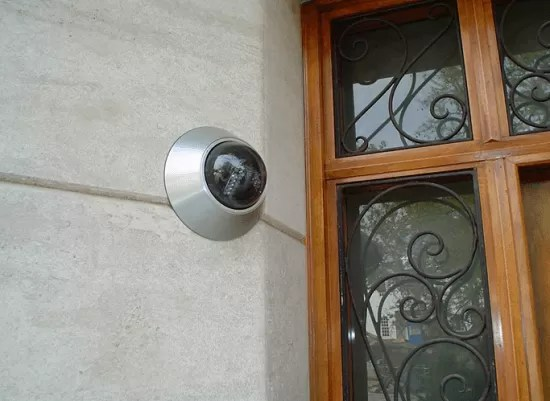 If you want to view people better outside,a security camera is your best choice. 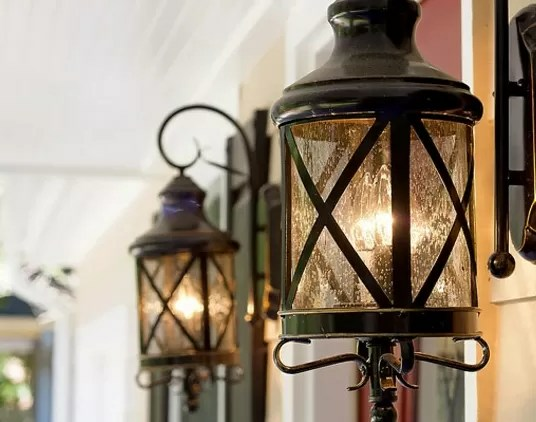 Burglars and other unwanted guests are less likely to approach a home with plenty of lighting because they can be easily identified. Installing motion sensors or lighting systems get activated when it gets dark. This will act as an excellent deterrent, ensuring that you have good visibility around the door. Securing the front door of your rental property should be one of your main priorities to protect your home while on vocation. If it is easy to enter your home, you could end up paying a heavy price. Try those methods above to burglarproof your front door. If you have other door safekeeping tips, share with us by leaving a comment below. The front door of a rented property is often an overlooked feature. But statistics turns out that nearly 66% of all burglaries are front door break-ins.